Mycotoxins! Moldy Nuts? No pun intended. As I have become more aware of the foods I eat, and the preparation involved to eat & live well, I cringe at the thought of what I used to consider food! I am thankful that I was privileged enough to live with a roof over my head, a fab mamma to take care of me, and a beautiful family to fill me with love! Remember the days of eating Jiffy peanut butter with mom’s PB&J? Or if you were like me, eating Jiffy by the tablespoons in consecutive sequence! I adopted this “great” habit from my sweet grandma, Lila. To this day, she still does this! There are so many of us that LOVE to eat all different types of nut butters, or anything that has to do with nuts. “Fancy” nuts, cajun, garlic, even in their simplest form, peanuts in the shell! Gratefully enough, I’ve come to realize that nuts are actually detrimental to your health, impairing digestion! Nuts are filled with what are called, Mycotoxins. Well, this is exactly why I’m here! Mycotoxins are literally toxins produced from fungi that have grown on crops, tree nuts, and can be found in other environmental surroundings, like the air we breathe. They are extremely toxic & can create disease in humans and animals. The different types of mycotoxins are: Aflatoxin, Ochratoxin, Trichothecene, & Zearalenone. You don’t really need to know their scientific names, but just in case you’d like to know! When you eat foods that are loaded with mycotoxins, they make their way to the digestive system & sit there for your entire lifetime! Once they’re ingested, they can leach through the digestive system and can be absorbed through the circulatory process. Once the mycotoxin is absorbed, they can become toxic to the host, which is YOU! This later leads to inflammatory concerns, lack of digestion, and other relating issues. Mycotoxins aren’t only in the foods listed above, they’re also in the air, carpet, & walls. However, this blog post is specifically for the mycotoxins that are found in the foods we eat. Do you need to forever refrain from eating nuts? Can you “kill” mycotoxins? Heck no! Its quite simple, actually! I have always been a lover of tree nuts, and love the amount of nutrition they have to offer. Nuts & seeds are perfect options for fat, protein, & minerals. If you choose to eat tree nuts or seeds, there is a proper way to prepare them. Mycotoxins aren’t actually alive like mold spores. So when we talk about “killing mycotoxins,” or getting rid of them, it really means breaking down mycotoxins and their toxicity so they are no longer dangerous to humans. This can easily be done by soaking & dehydrating the nut. Back when I was in college, I used to roam the local Safeway and health food stores’ bulk section. My favorite part of grocery shopping? Putting my hand under the nut dispenser! Nothing like a great handful of mycotoxins from raw cashews, almonds, or pecans to hold of your starving college hunger, right? How can you eat nuts & seeds that are free from harmful mycotoxins? Soak Your Nuts! And Seeds. Soaking your nuts anywhere from 20 minutes – 2 hrs is an ideal time frame. Many people soak their nuts and seeds over night. However, using the artistic science of QRA, 20 minutes – 2 hours max seems to do the job perfectly! In order to prevent mold from recreating its life cycle, you must dehydrate the nut or seed completely! 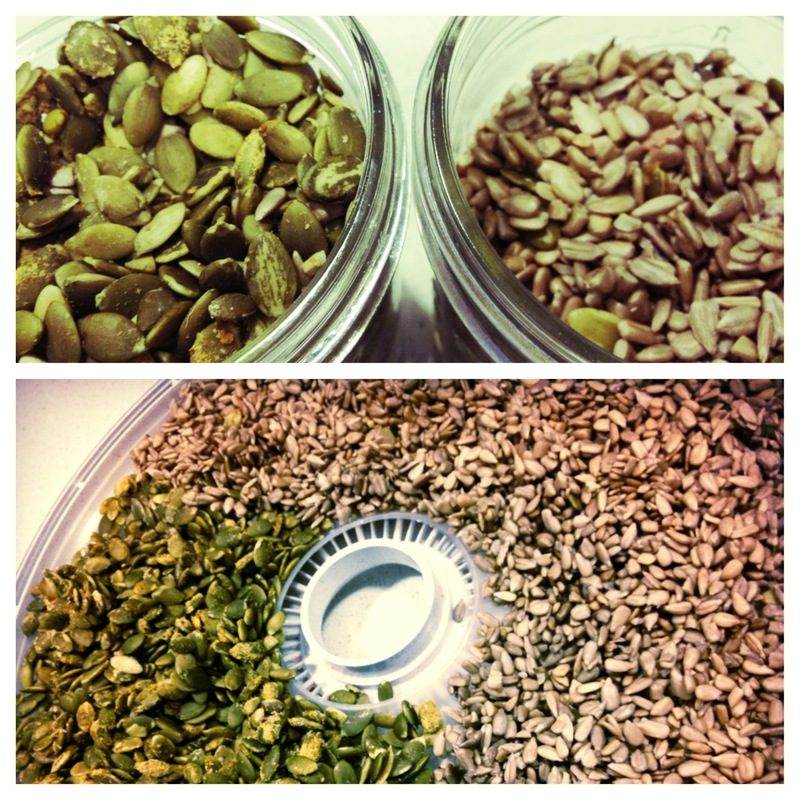 Dehydrating nuts or seeds at 115°- 125° for 8-10 hour works perfectly! This step is very important! Dehydrating these beauties prevents eliminates & prevents the future growth of fungi & mold! At this point, while the nut is still moist from soaking and rinsing, you can add pink salt, or any other spices you may want to flavor your nuts or seeds with. 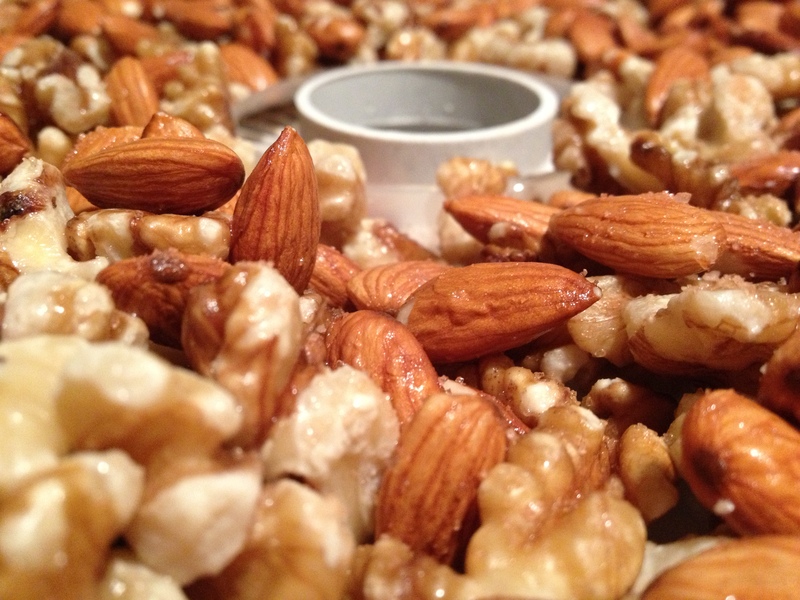 Adding pink salt gives the nuts an amazing roasted flavor. You can absolutely taste the difference! In a later blog, I’ll teach you how to make a fermented nut crust for raw deserts. Once you’ve dehydrated your nuts or seeds, you can pack them into your mason jars for your week supply of protein & fat rich snacks! These beauties are always the perfect addition to any salad. They’re just as fantastic when you eat them on their own by the handful! Mason jars are the best storing container. Make sure to seal your lid tightly to eliminate any oxidation. Eating stale nuts & seeds isn’t so pleasurable to the palate! Keep your eyes bright for other recipes featuring properly prepared nuts & seeds! Previous postFor the Love of Ferments! Whoa, this is great information to have! I am so thrilled that you appreciate this information! Keep posted for more! Great info! Thanks! What are your thoughts on making homemade nut milk and nut butter? Do I have to dehydrate first or is soaking good enough if the nuts are going to be consumed right away or within a couple days? Hi Jessica! I love making my own nut butter! However, there are simple steps to take! 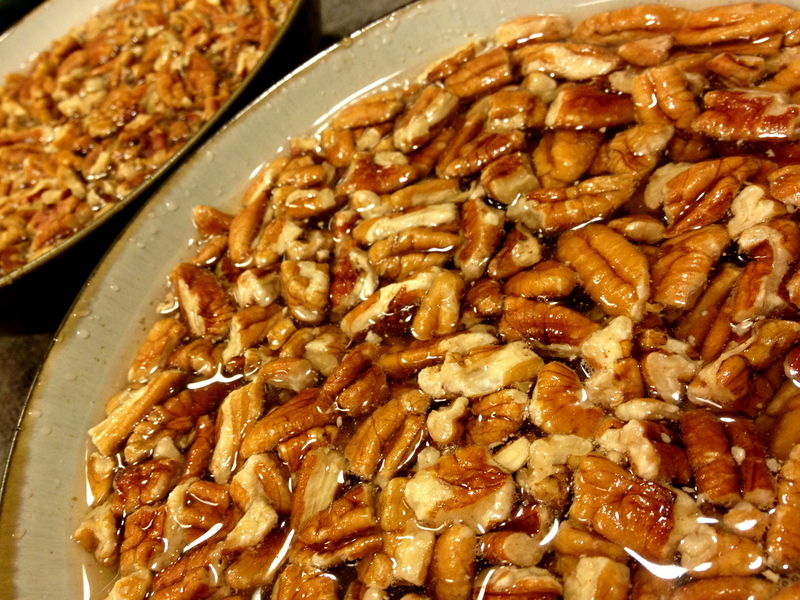 Soaking and fully dehydrating is absolutely required before blending your nuts into a butter form. I am totally all for making nut milk as long as the nuts have been fully soaked and rinsed. Making butters or nut milks without this step still exposes the body to these contaminants. If you’re going to be making nuts in bulk, I highly recommend dehydrating them. After a day or so after soaking the mold spores can most definitely begin to grow! But if you just want to use nuts for smoothies or salads where they will be eaten moist, surely the dehydration is unnecessary? I don’t see why you can’t just soak, then rinse them and place them straight in freezer to avoid mold? if you are going to be blending them or eating them with moisture, then no need to dehydrate. At that point extra crunch would just be a preference 🙂 In regards to placing them in the freezer, that definitely sounds like an experiment! i have eaten blanched almonds and toasted/baked them….still, gave my weird gut, head and neurological symptoms. I know people say the phytates, tannins and toxins are removed from the soaking process, but if you are sensitive to them like me, there just is no possible way its going to work. I have to say bag eating nuts because it makes me feel like sh**. For some people, it can definitely be more of a challenge for the body breakdown foods no matter what they do. In certain situations, when foods are consumed at a high frequency they can actually alert the body to want to defend itself because of the antinutrients within, or other potential contaminants, creating an allergic reaction. In a clinical setting, I have seen many individuals who have had a history of consuming non-organic nuts for a period of years, to where their high consumption rate has actually created a sensitivity to the food. Regardless of organic or not. However, I have also seen these reactions no longer be an issue for the person! Curious to know if you have a history of eating nut butters? nut butters i cannot do…i like coconut butter, but can’t do it. I have since gone on a mold detox diet, which eliminates all nuts and legumes from my diet. What does a mold detox diet look like? I have never heard of it. I eat Autoimmune Paleo. When I am doing well I often try to sneak corn, legumes, coconut or nuts back into my diet. (Please just let me have a corn tortilla every once and a while) But it often comes back to bite me. Hi Mame! That’s a really great question! There are many diets that advocate foods that are not susceptible to mold. Many foods have them unfortunately… There is hesitation from my philosophy in the way that I view health in regards to the Paleo diet. I personally don’t advocate cooking foods beyond a certain temp, especially meats. Highly cooked foods including meat create a defensive response by the body, called leukocytosis. Also, eating these highly cook foods liberate what’s called a nano bacteria. This bacteria heavily suppresses the body; primarily the kidney, pancreas, and the spleen! I would highly recommend that you look into Dr. John McDougall and his research in regards to eating plant-based and removal of oils from the diet. My mentor is Dr. Bob Marshall, I’d also recommend you listen to him on Saturday mornings at 9a! You can visit http://www.qnlabs.com to listen to radio archives! Hi Angela! Yes, they absolutely can! Even better when they’re soaked prior! You may just need to use more water than you would with already soaked nuts! Let me know how it works for you! Tannisha 😉 no worries:) I’ve they’ve already been soaked prior to dehydrating, there isn’t any real reason they would need to be soaked again. What I would do is add an additional 1/2 cup to 1 full cup of water when blending the dehydrated nuts. still available throughout the dehydration process. Dehydration is to eliminate mold from moisture of the nut. So happy you’re finding what you’re looking for here 😝 oil free is a life changer! See it in clinical practice on the daily! Can I dry out the nuts in the oven if I don’t have a dehydrator? What temp and for how long? Thank you for sharing this with us. I’d put forward a suggestion to soak nuts/seeds for 10-20 min in a 3% food grade hydrogen peroxide prior to overnight soaking. Would it be too way too much soaking – h2o2 first, then sea salt overnight, then on top of that dehydration… Perhaps one day I will make the full cycle my regular routine. It appears that just soaking overnight in mineral solution (sea salt) isn’t enough? I mean if I soaked them then blended/mixed with a little bit of water into a mash , then sealed it and put into the fridge and ate all of let’s say 100g on the same day. Would it be safe practice? I’d appreciate your take on this. Do packaged roasted nuts have the same molding problems since they are roasted? Also, what about non gmo’s and organic nuts? I have just done my first batch of activated nuts. I used my hydrator for longer than necessary to ensure they were dry before sealing them in a mason jar and popping them in the cupboard about 10 days ago. I have just opened my second jar and notice mould starting to form on the top of the nuts. Are they saveable or do I have to throw them away? Hoping to save them as there is a lot o money in that jar! Great! Thanks! I tried soaking mine over night, I guess I did it wrong because when I poured the water out I saw that they had mold all over them. 2 hours won’t do that, so I’ll take that advice!